Director Michael Gondry continues to prove that he was a one hit (sort-of) wonder with Eternal Sunshine Of The Spotless Mind. The nutty director continues to make even kookier documentaries, none more crazy than this one, Is The Man Who Is Tall Happy? 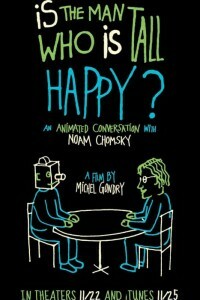 The big screen documentary that plays in a handful of movie theaters is a series of interviews featuring linguist, philosopher and activist Noam Chomsky done in hand-drawn animation.